What is Cleveland Public Library’s new TechToyBox? It’s exactly what you would imagine it to be — a collection of digital devices that provide hands-on experience with technologies that may not be affordable to many of our patrons. From an array of eReaders to tablets, the Library’s TechToyBox makes the latest devices available and puts them in the hands of patrons. Yet, the TechToyBox isn’t just about gadgets; it’s about learning how to use them effectively through one-on-one training and eMedia classes that are offered at the Main Library, as well as throughout the branches. Especially exciting and unique is the fact that patrons aren’t limited to using the tech toys inside the Library. Rather, they can check some of them out and take them home to gain a higher level of familiarity. Cleveland Public Library is one of the first libraries in the country to loan out such leading-edge tech devices as eReaders and tablets. Cleveland Public Library was one of the first libraries in Northeast Ohio to purchase a 3D printer. 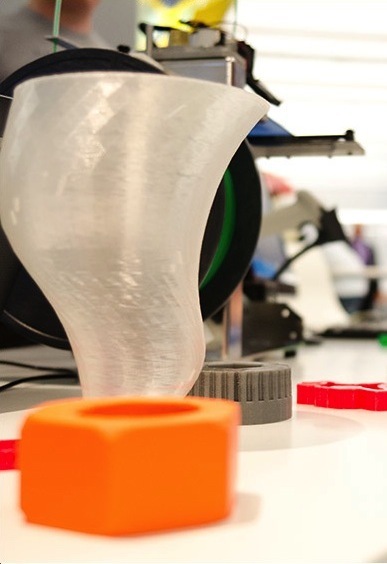 A 3D printer utilizes 3D modeling software to produce 3D objects in plastic.